The Large Hadron Collider has been pretty busy lately, probably discovering the Higgs Boson, and definitely not destroying the world and whatnot. It's probably earned a little time off, right? You bet it has, which is why it's going down for a two-year nap. As of Valentines Day, the LHC won't be running any more tests for a while, and during this downtime, technicians will be skittering all over it, polishing up its fancy bits for the next bouts of testing; not the most relaxing vacation ever. After the rest, the LHC should even be ready to handle collisions of higher power than ever before. 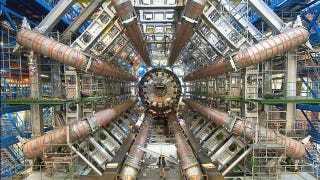 The LHC was originally designed with 14TeV (Tera-electron Volts) collisions in mind, but due to some early problems, it's never manged one more than 8TeV. When it wakes back up from its nap in 2015 however, it should be a little closer to that goal.